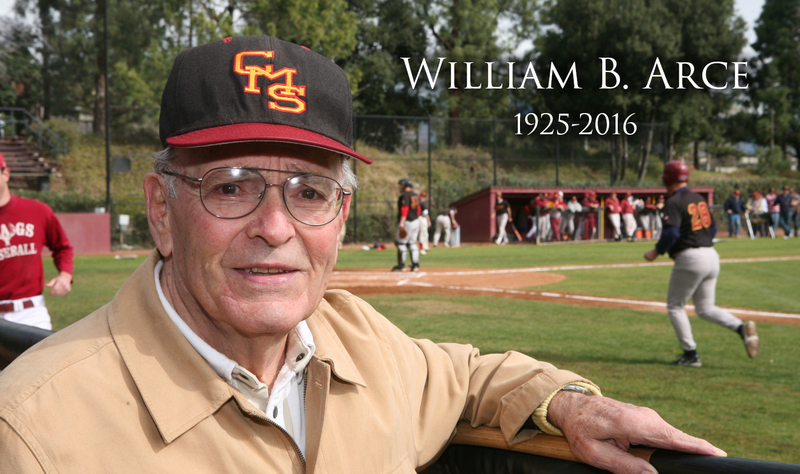 With much sadness, we want you all to know that a beloved member of our community, Bill Arce, founding Claremont-Mudd-Scripps (CMS) athletic director and Stags head baseball coach, passed away Monday. He was at Pomona Valley Hospital in the presence of his close family. Coach Arce was 90. Coach Arce has touched so many lives, so many generations of Claremont athletes—as the architect of our acclaimed athletics program, as the epitome of the scholar-athlete ideal, as mentor, friend, and colleague to so many members of our community. During his 27-year tenure as head baseball coach and CMS athletic director, Coach Arce laid the foundation for both the philosophy and program of what was a startup athletic department in 1956. He pioneered one of the top NCAA Division III private college programs in the country. Thanks to his guiding vision, leadership, and lasting impact, our Stags and Athenas have gone on to meaningful, successful lives. Well after his formal tenure, countless students have benefitted from the Arce Scholarship Fund, created in his honor to support student leaders on our campus. In addition to his work in Claremont, Coach Arce was instrumental in growing the game of baseball internationally, as evident with his inductions into the Dutch and Italian Baseball Halls of Fame. His passion for youth development and the growth of baseball internationally led him in 1985 to found International Sports Group, Inc. (ISG). Over the years, many Stags baseball teams had the opportunity to travel overseas (Holland, Italy, and France) and play for Coach Arce. In 2000, the American Baseball Coaches Association (ABCA) selected Coach Arce as its recipient of the Lefty Gomez Award, an award presented each year to an individual who has contributed significantly to the game of baseball locally, nationally, and internationally. For his years of dedication and valuable work, Coach Arce was inducted into the Claremont-Mudd-Scripps, National Association of Intercollegiate Athletics (NAIA), and ABCA Halls of Fame and received the SCIAC Distinguished Service Award. From the growth and prominence of women’s sports at CMS to the diverse array of physical education offerings, Coach Arce has left an indelible legacy on the Claremont McKenna College and CMS Athletics communities. Please join us in offering our heart-felt condolences to the Arce Family during this difficult time. Information about a public memorial service for Coach Arce will be made available as soon as those details are finalized. Note: If you would like to make a gift in Dr. Arce's honor, you may visit the donation page.